Roman Reigns returned to WWE and RAW and had good news for his adoring fans from around the world. The Big Dog announced that his cancer is in remission and that he's back! Sean Ross Sapp of Fightful.com has more details on the return of Reigns to WWE, and the decision to bring him back to the WWE earlier than many expected. Last year, Roman Reigns announced that his Leukemia had returned and he had to step away from the ring, relinquishing his Universal title. Since then, Reigns has been involved in the movie, Fast & Furious Presents: Hobbs & Shaw, alongside The Rock, while also making a guest appearance in Nickelodeon's Cousins for Life. On RAW this week, he announced that he's ready to return to action, thanking the fans and his family for the support, and that their strength and prayers helped him beat the disease. Reigns came to the aid of Dean Ambrose with Seth Rollins later in the day when their former Shield brother was attacked by Elias, Drew McIntyre, Bobby Lashley, and Baron Corbin. 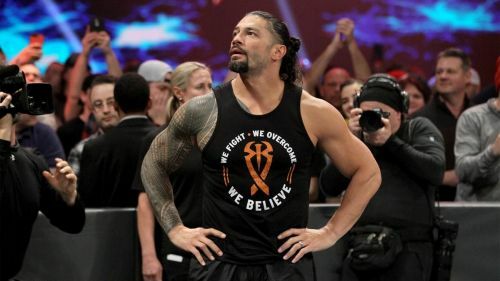 The Fightful report states that only Vince McMahon, Stephanie McMahon, Kevin Dunn, Michelle Wilson, and Triple H knew that Reigns was cancer-free only on Monday morning after Reigns was told by his doctors last week that he no longer had cancer. Reigns was scheduled to appear on RAW to give an update on his health. Reigns will appear on Good Morning America on Tuesday for another update. WWE Rumors: WWE already planning The Shield reunion?